Each year the Ellis Team studies a publication put out by the National Association of Realtors research department. This year we’re studying the 2018 National Profile of Home Buyer and Sellers. We do this for several reasons. We’re able to gain insight on how best to serve the buyers we work with. We want to know what issues are most important to them, and what issues might be affecting them. When we identify and isolate these issues, often we can come up with solutions for them. By understanding buyers needs better, this also helps us with sellers as what affects the buyer usually comes back around and affects the seller. Better understanding buyers helps our seller clients tremendously. The most educated and skilled agents tend to come up with the best solutions, and when this happens everybody wins. Secondly, we want to understand home sellers better too. Sellers have needs that need to be addressed. We want to pay attention to changes. Even though our team has loads of experience, we can’t let that blind us to the possibility things are changing in real-time. So, what did we learn this year? Gross household income increased to $91,600, up from $88,800 the previous year. The median age of a home buyer is now 46, up from 42 back in 2013 and 45 last year. 63% were married couples, 18% were single females, 9% single males, and 8% unmarried couples. Children in the home decreased to 34% and has been on a steady decline from 40% since 2013. 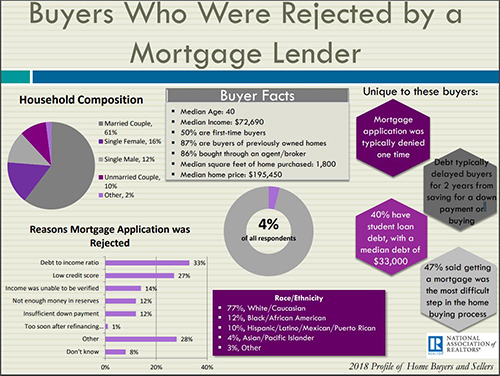 Drilling deeper into the reason buyers were rejected for a mortgage we found that 33% were rejected due to their debts being too high relative to their income. 27% had a credit score that prevented them from buying, while 14% had income that was difficult to verify. Buyers of new homes had a median income of $111,770 while buyers of existing homes had a median income of $89,100. Did you know that 15% of buyers chose their neighborhood because of their pet? We can’t tell you how many buyers won’t buy a property due to neighborhood restrictions on pets. It’s often the first question we get regarding condo or HOA documents. Student loan debt typically delayed a home purchase for 2 years, and the typical student loan debt was $28,000. 3% of buyers are active in the armed forces, while 18% of all buyers were veterans. The Internet played a large role in the purchase of real estate. 83% frequently used the Internet to search, and 90% used an agent. 88% found the detailed property information useful while 90% found the photos useful. Single females outpaced single males 2 to 1 in purchases. Convenience to friends and family was important to single females while convenience to job was important for single males. 54% of unmarried couples rented together before purchasing. First time home buyers expect to be in their 1st home for 10 years. Repeat buyers expect to be in their next home 15 years. The stats go on and on. We like to look at data to see if there are trends we need to pay attention to. For instance, we notice a rising age in the typical home buyer. Is this because younger people are delaying their first home purchase, or having trouble saving for the down payment or qualifying for the mortgage. Once we identify the issue, we may be able to identify a solution. We do have some down payment assistance programs available. It’s all about knowing where to look, if you ask the right questions. Only 4% of buyers can purchase a home without help. The rest either need help getting a mortgage or have something to sell first. This is where a good Realtor comes in. We listen, we identify, and we help. Call us at 239-489-4042 and see how we can help you, or search the MLS for Free at www.LeeCountyOnline.com If you have questions about selling a home, ask for Brett or Sande Ellis Ext 4. Posted in Cape Coral, Cape Coral Real Estate, Fort Myers, Fort Myers Real Estate, Southwest Florida Real Estate.Tagged 2018 National Profile of Home Buyer and Sellers, Buyers who were rejected by a mortgage lender, Ellis Team featured property of the week, Find out what your home is worth.